We only have the ‘before’ data, for 22 streets throughout the area that were monitored for traffic volume and speed in November/December 2018. Here’s what it means. 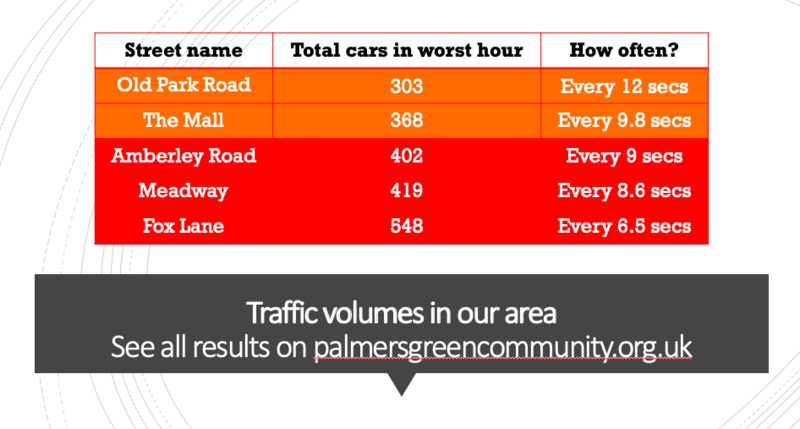 All the traffic data is available on the Palmers Green Community website. You can look up the volume of traffic on your street here,where it gives the number of vehicles in your street’s ‘worst hour’. But what does that tell you? If your ‘worst hour’ stats were 100 cars or fewer, good news – that’s a low traffic street (although you may have a problem with speed instead!). The table above also shows amber and red categories for traffic volume. This table gives the worst five streets for traffic volume – all are in the amber or red categories. Fox Lane itself comes out worst of all, with a shocking 548 vehicles in its worst hour – or one car every 6.5 seconds. That level of traffic belongs on a main road, not a residential street. Your street will also show traffic speeds in the ’85th percentile’. This means that 85% of drivers are going at this speed or below. Again, what does that mean? For our residential streets, an appropriate speed is closer to 20mph than 30. Why? See the image below. 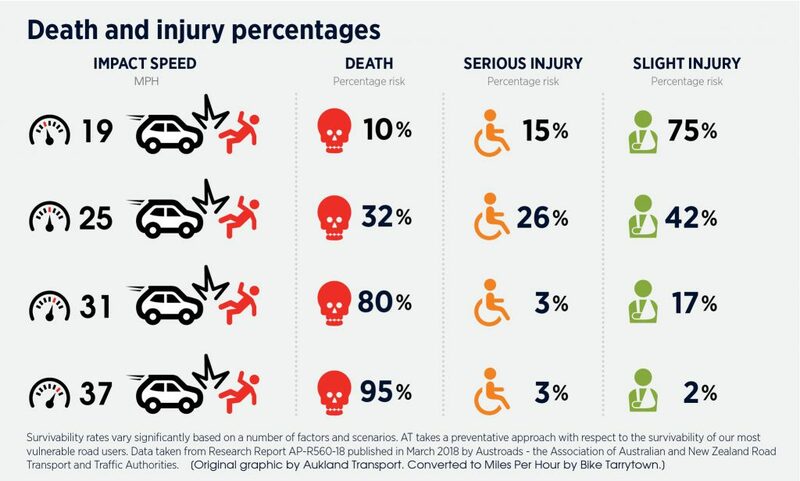 If you’re hit by a car doing just 31mph, you have an 80% chance of being killed. 19mph is more likely to leave you with a slight injury. People should be able to walk, cycle and spend time on the street in a residential neighbourhood. 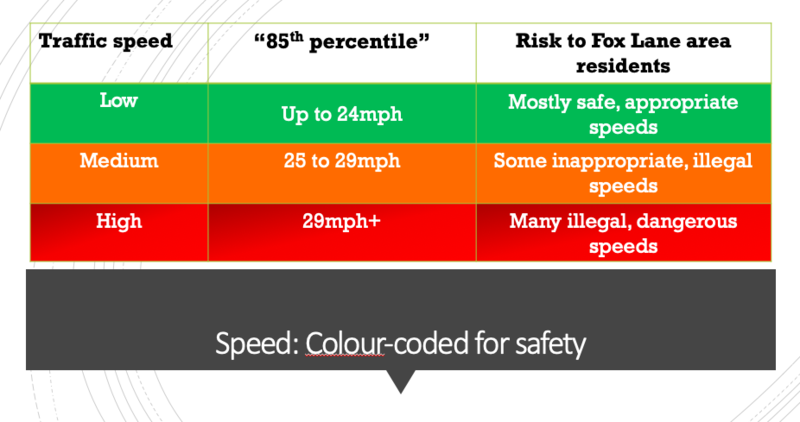 So 85% of drivers should be doing 24mph or less. 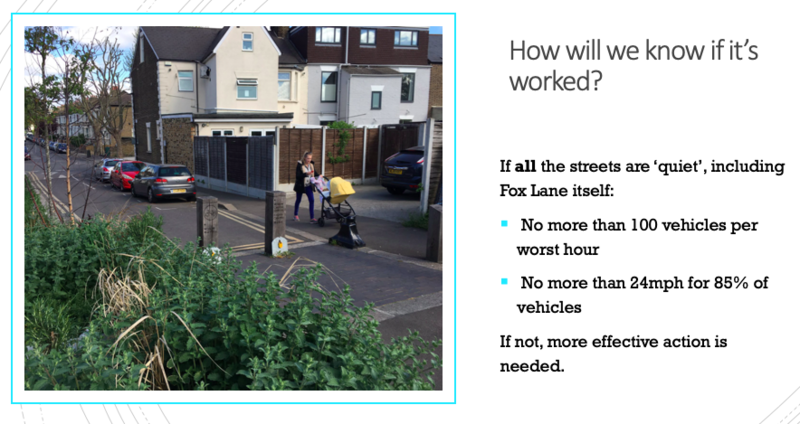 This is why Better Streets for Enfield believes that all the streets within the neighbourhood should be 20mph – and the surrounding main roads as well. 20mph is the right speed limit for streets where people are living, shopping, crossing the road and so on. 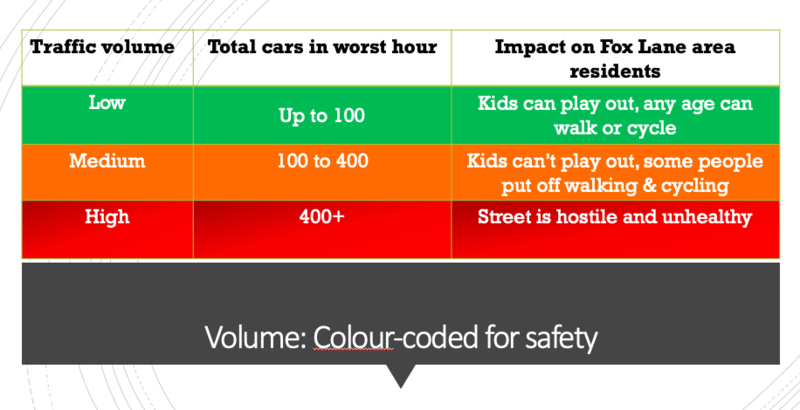 Here are some of the worst streets in the neighbourhood for speed, all in the red category for safety. The traffic data also showed the top speeds recorded on each road. They range from shocking (65mph) to downright unbelievable (83mph). Here’s what the whole area looks like, colour-coded for speed and volume. Some are amber or red because of speed (eg Bourne Ave) and some because of volume (eg The Mall). The result is that only three streets in the area are green – safe, ‘healthy’ streets. Then the final monitoring will tell us: has it worked? How will we know if it’s worked? 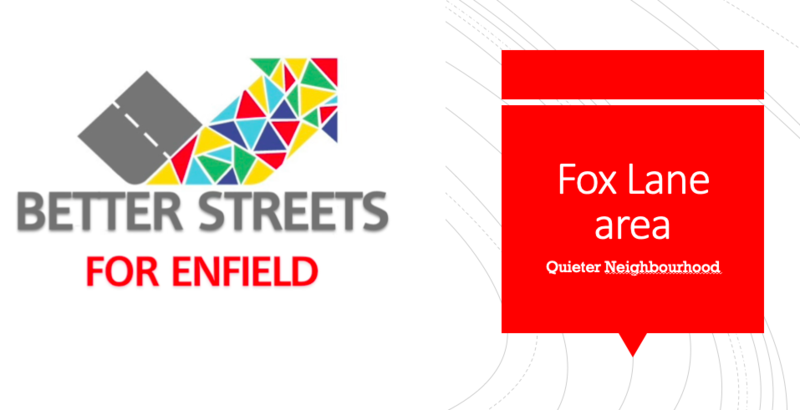 The stated aim of the Fox Lane scheme is to reduce traffic speed and volume to “create an environment where walking and cycling are facilitated and seen as the preferred method of travel”. As Better Streets, this is how we’ll know if it’s worked – the data from every street will be in the safe, green category. The slide below explains what puts a street in our green category. It also shows a street in Waltham Forest, where ‘filters’ (like the bollards shown) have reduced traffic volumes from 1000s of cars per day to 100s. The resulting streets are quiet enough for any age to walk or cycle and children to play. This treatment would be transformational on Fox Lane. We don’t know if the planters and other measures will achieve this effect. Fox Lane itself has the worst traffic volume of all, and no planters are planned for it. But we will wait to see what the final analysis tells us. 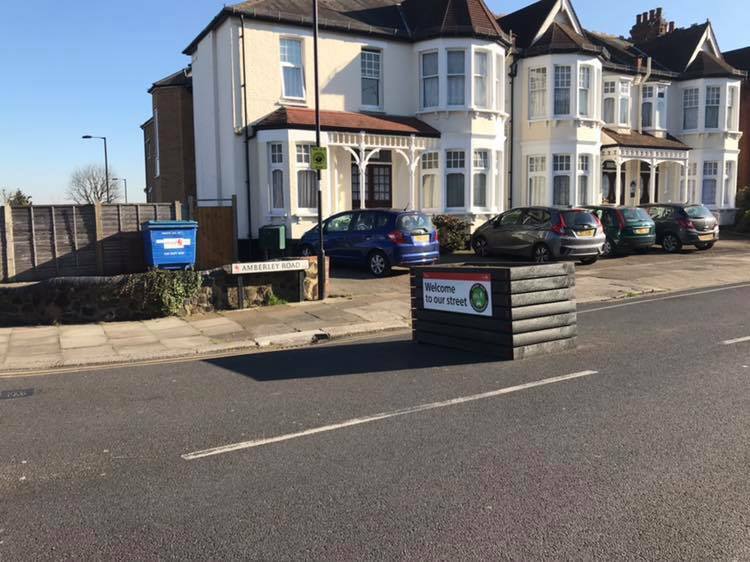 A resident of Amberley Road felt that the planters have made the junctions much safer – drivers are giving way to each other and to pedestrians crossing the road. There was frustration that informal 20mph signs, which were shown in the consultation plans, never showed up. The council have said that these were dropped because they ‘could not be enforced’. Planters on The Mall, Selbourne and Amberley have been moved to one side where they are less effective. A few people thought this was done by disgruntled drivers or residents, rather than drivers colliding with them. 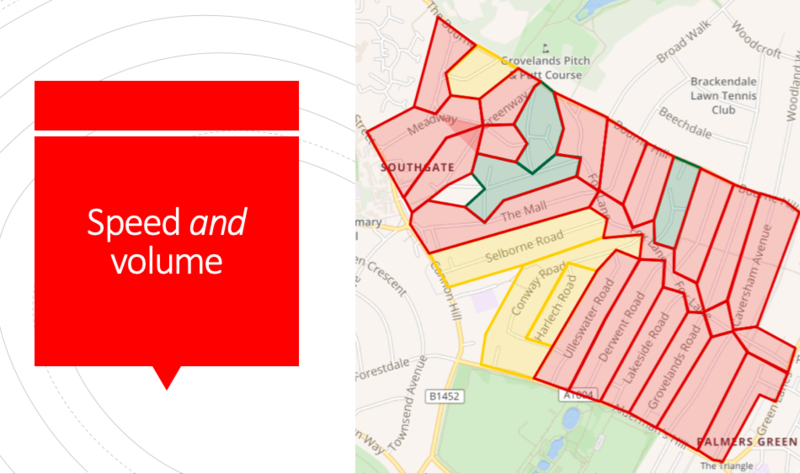 A few people said they would support road closures (filters) as used in Waltham Forest. No one spoke up against the idea.